EZOnlineDocuments also offers optional professional hosting services that exceed all SEC rules and recommendations. 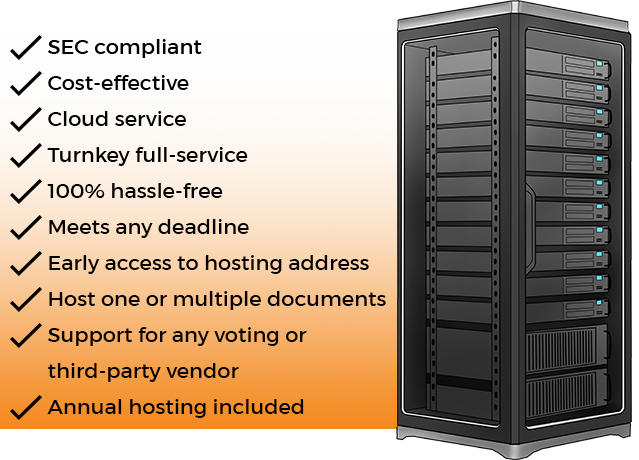 Use our hosting service to ensure your project is 100% compliant. Do you know the SEC rules regarding Proxy Statement hosting? Can host one or multiple documents as needed, including cross-linked document "kits"
Turnkey full service solution—100% hassle-free! Contact us today and we can provide a custom quote for your project.